Stäubli, leading global provider of high-quality automated systems and solutions for the weaving industry, will be presenting its product range this August at Febratex, Brazil’s largest trade fair for the textile industry. Visitors to the booth will have the chance to find out how Stäubli’s solutions for workflow automation, automated weaving preparation, and shedding for frame and Jacquard weaving can enhance their mill operations. Stäubli’s state-of-the-art weaving and knitting technologies enable weaving mills to efficiently and cost-effectively produce high-quality fabrics of all sorts for a wide range of applications. Visitors to the Stäubli booth (Booth 100, Sector 1, Street 7) will find this a perfect opportunity to learn all about the product range of Stäubli Textile and talk with Stäubli experts about solutions to their specific needs and applications in the mill. The pioneering products of Stäubli are the result of a well-balanced combination of reliable performance, technical perfection, and proven technologies. The renowned TOPMATIC warp tying machine will be on display in operation, processing a 100% cotton warp without lease. This machine handles yarns in a range of 0.8 - 500 tex / Nm 2 - 1,250. Featuring double-end detection, it ensures optimum tying quality and helps minimize downtime of the weaving machine. Handling a broad range of yarns and offering easy operation and quick set up, this machine can easily be integrated into the operations of any mill. With its SAFIR automatic drawing-in installations, Stäubli brings further time savings into the weaving preparation process. Featuring state-of-the-art technologies such as double-end detection and repeat detection and management (both colour and S/Z), SAFIR machines are suitable for a wide range of applications and use in a variety of setups. They are ideal for weaving mills of any size that seek to optimize their workflow and increase their product quality. The broad range of Stäubli cam motions and dobbies includes ideal machines for any type of weft insertion system for any application. The latest generation of the S3000 and S3200 series of rotary dobbies incorporates a new locking system, which is the heart of every dobby. This evolutionary feature provides enhanced security for the selection of the heald frames, allowing higher running speeds, superior reliability, and less noise and vibration. And Stäubli has increased the efficiency of frame weaving installations even further with its recently launched maintenance-free harness motions. When it comes to Jacquard weaving, mills can choose from Stäubli’s competitive product range of Jacquard machines. Whether terry cloth, narrow fabrics, upholstery fabrics, or technical textiles, Stäubli Jacquard machines master every challenge. The recently re-engineered LX series features a lifting mechanism that allows high-speed weaving of even extremely heavy fabrics. With a coaxial drive shaft and a special chassis supporting the beams and bearings, the latest models can handle up to 26% greater loads than the previous models. Improved positioning of the fans in the LX housing optimizes internal airflow, ensuring that the machine interior remains clean and at a controlled temperature. LX Jacquard machines are available in sizes up to 6,144 hooks. One of the latest models in the high-speed LX series is the LXL, designed for even greater load capacity. This model can be equipped with 6,144 to 16,384 hooks. 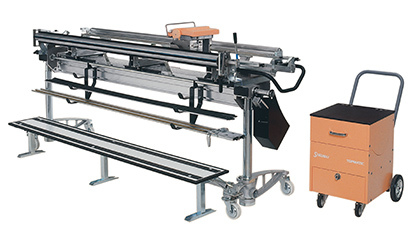 Formats up to 32,768 can be achieved by combining two machines. And because a precisely matched Jacquard system gives mills even higher performance, Stäubli offers high-end harnesses for any application, which also enables weavers to swiftly respond to changing market needs. Stäubli’s recently launched D4S device is an automation solution that significantly shortens the production process of socks. Socks must no longer be removed from the knitting machine for closing the toe on a separate machine. The D4S can be mounted directly on the circular sock knitting machine; it closes the sock immediately after knitting. The D4S significantly increases output and ensures optimum quality.